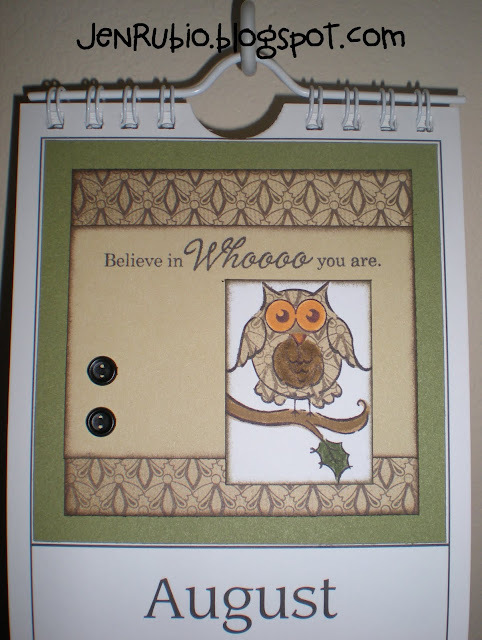 January Stamp of the Month Blog Hop! Welcome to our January SOTM blog hop featuring the January Stamp of the Month - Little Reminder S1201! 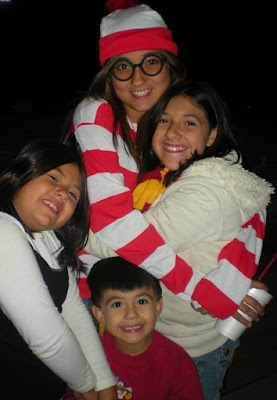 If you have joined me from Wendy's blog then you are on the right path. 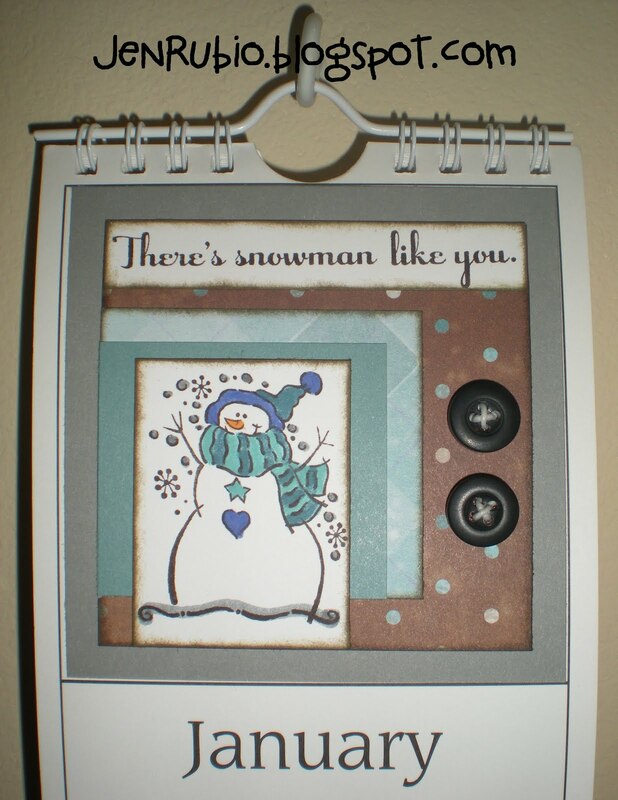 I can't take credit for this adorable idea, but it is just so cute that I couldn't resist sharing it here with all my creative friends! 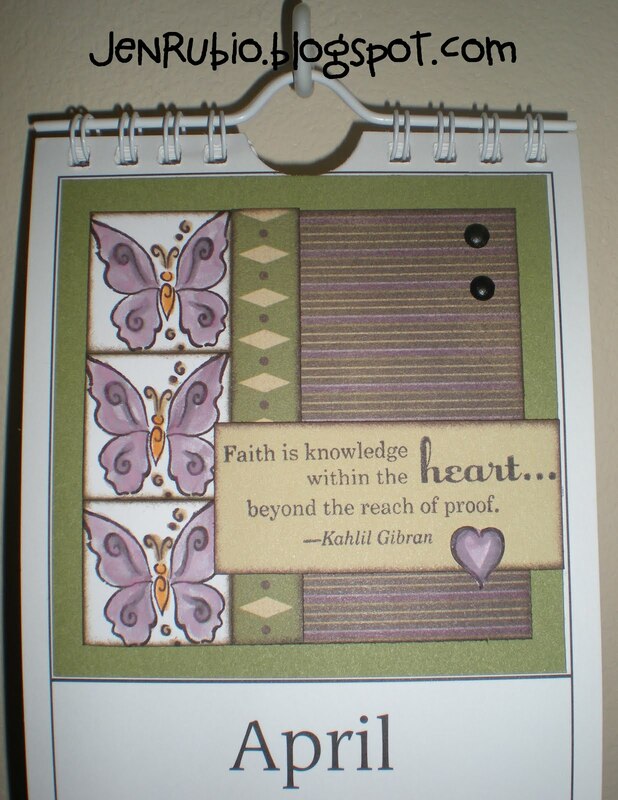 This was created by my crafty friend Kathy Hazelbaker. Wrapped inside is a Hershey's chocolate bar, yum!! Here is the link to Laurie Furnell's blog where you can find and print the wrapper (although you know I've already got the wheels a-turnin' in my head as to how I can re-create this with my stamps)!! 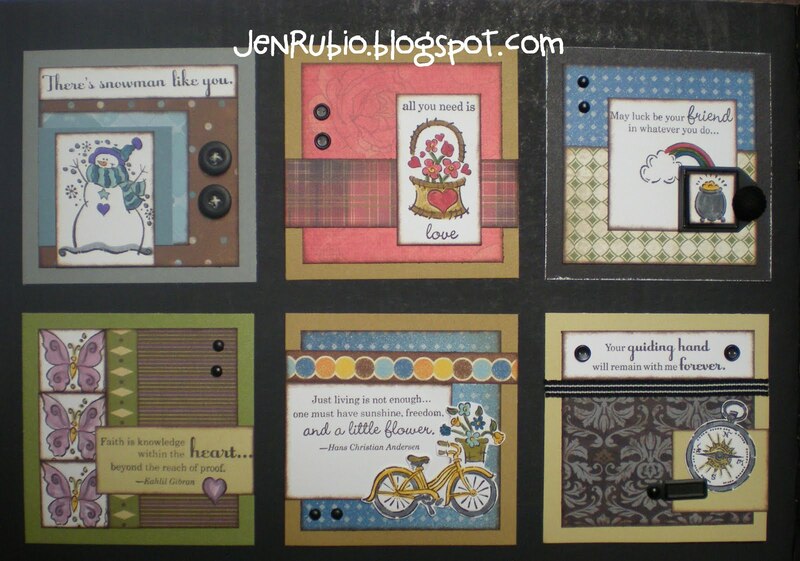 "Rock the Block" Blog Hop!! Welcome to my blog and thanks for joining us for our special "Rock the Block" blog hop! If you've just joined me from Krista's blog then you are on the correct path! 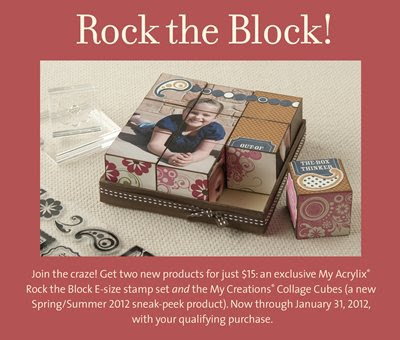 The "Rock the Block" kit is the new special promotion Close to my Heart is offering now through the end of January. 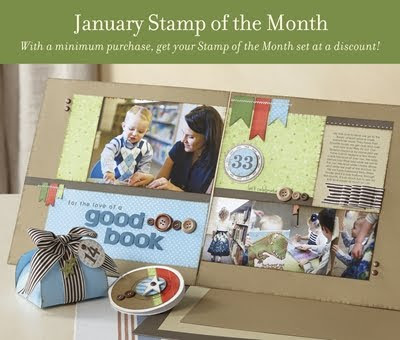 You can purchase this kit that includes an E-size stamp set and My Creations Collage Cubes for just $15 with any $25 purchase from our Autumn/Winter Idea Book! 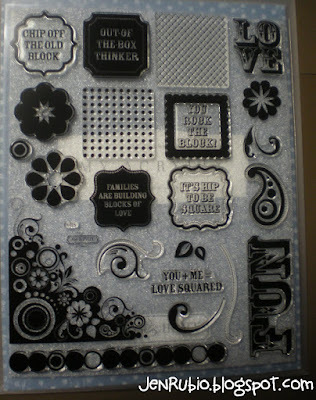 Here is just one side of my blocks completed...and I still have five more sides to go! I tied a ribbon around them to hold them all in place for now, but that ribbon will likely be adhered around the outside edge of the tray when it is all complete. I started by stamping a 6x6 piece of Olive cardstock and adding my photo and embellishing before I cut it up into 2x2 squares. Then I adhered them to the blocks with my tombow adhesive. 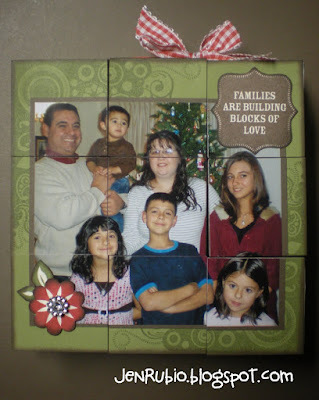 I will come back and post more photos of the rest of the block sides once I am able to complete them. 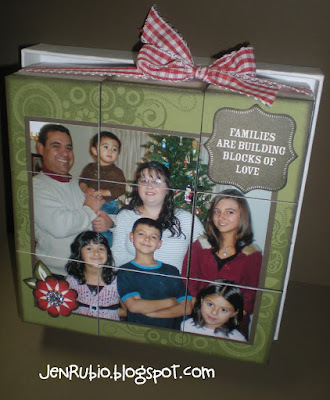 While this project was quite easy to put together once I got going, it took a lot of time at first deciding what photos I would be using. 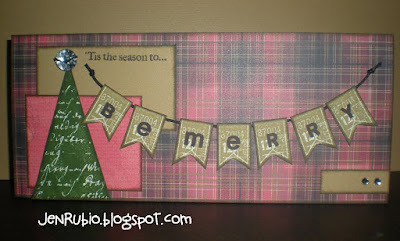 Once I'm finished, this will be something I can get out each year to display alongside all of my Christmas decorations! My four year-old already can't keep his hands off of it and I can foresee that it will be one of his favorite "puzzles" to play with every December! 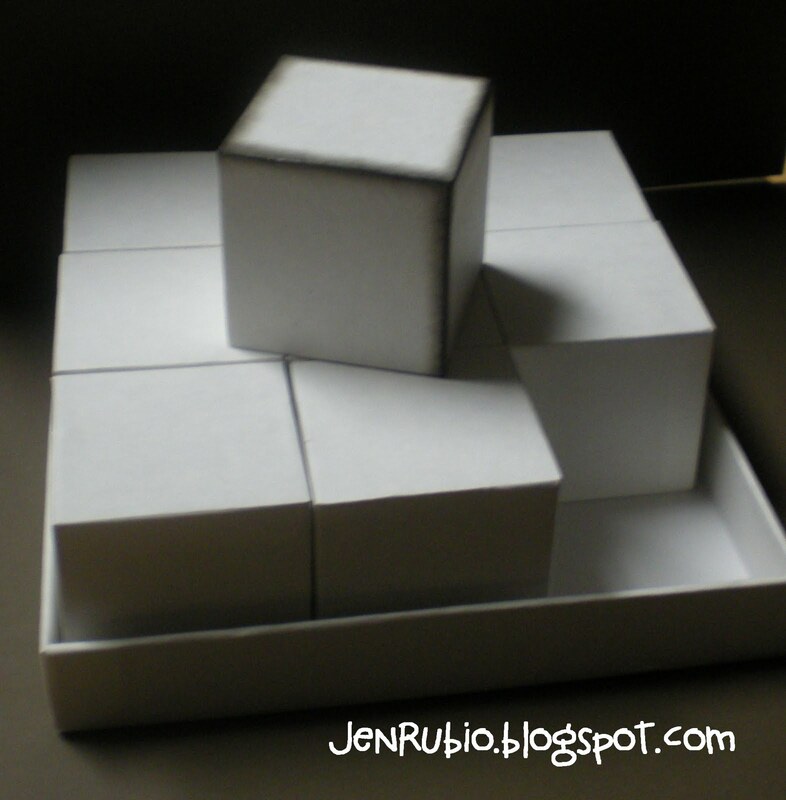 Here is a view of the cubes (above) inside the tray before I covered them and the co-ordinating 8.5x11" stamp set (below). The blocks are made of paper and are hollow so they are light-weight. Notice how I started sponging the edges and corners of the block on top using a sponge dauber and Cocoa ink. 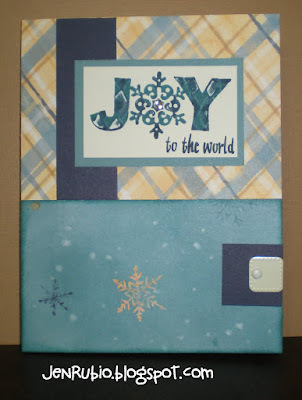 This way I will be sure not to have any white edges showing once I get all of my 2x2 squares of paper adhered to them. Well, I hope you like what I have shared with you so far! 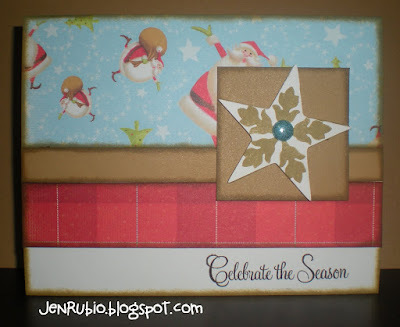 by visiting Jean's blog next! Enjoy!! 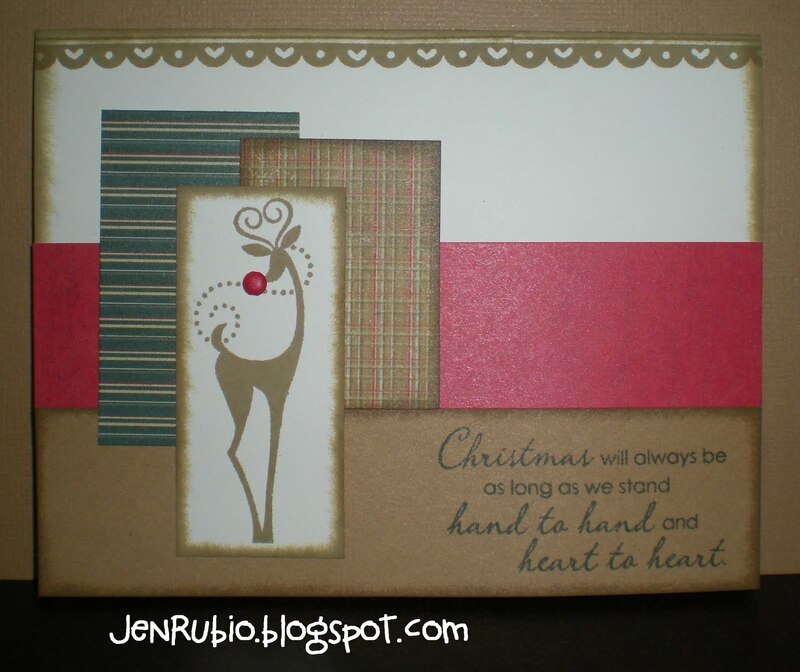 December Events (Clearance SALE and Christmas Card Buffet)!! 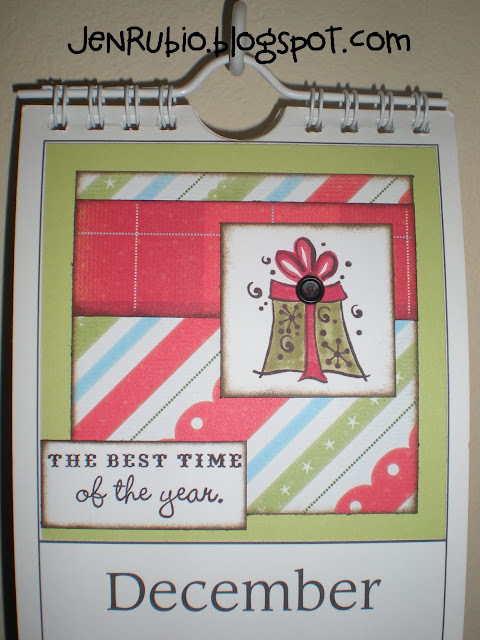 Happy December everyone! 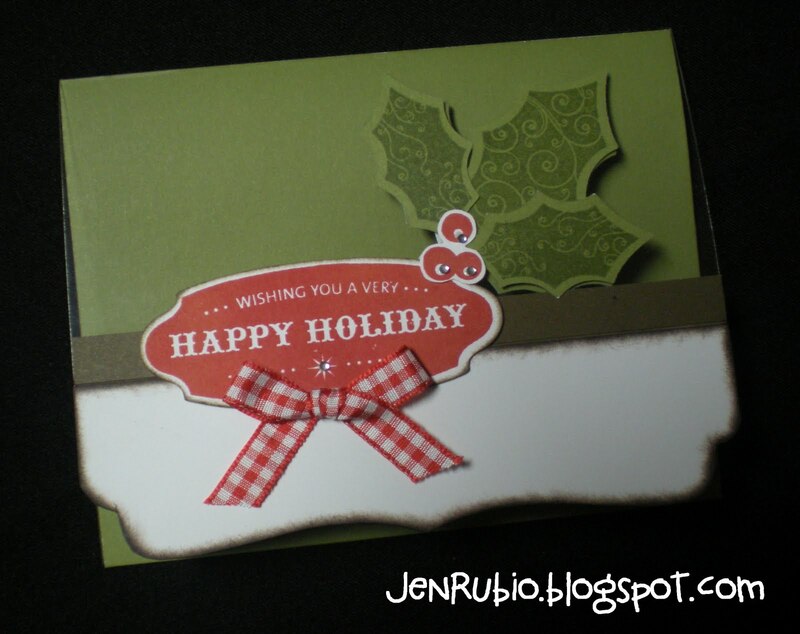 I am really looking forward to the upcoming holiday season and hope you are too! I have just a few events planned for this month. 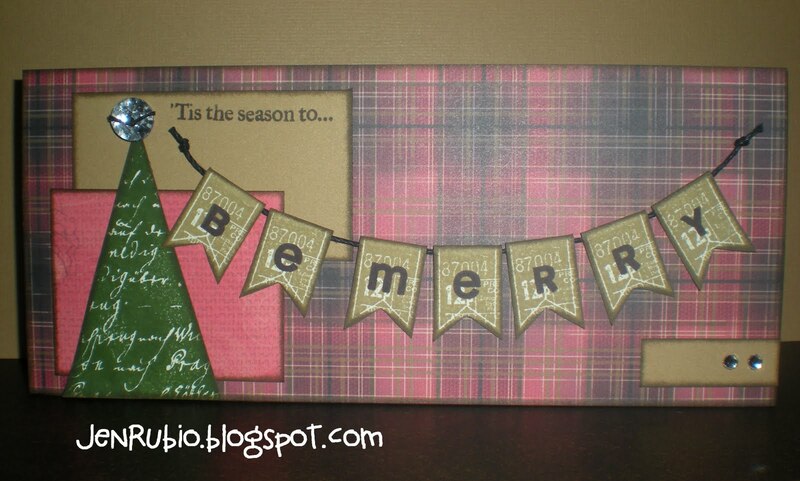 Tuesday, December 20th (6pm-10pm) last chance this year!! I hope to see you all here soon! 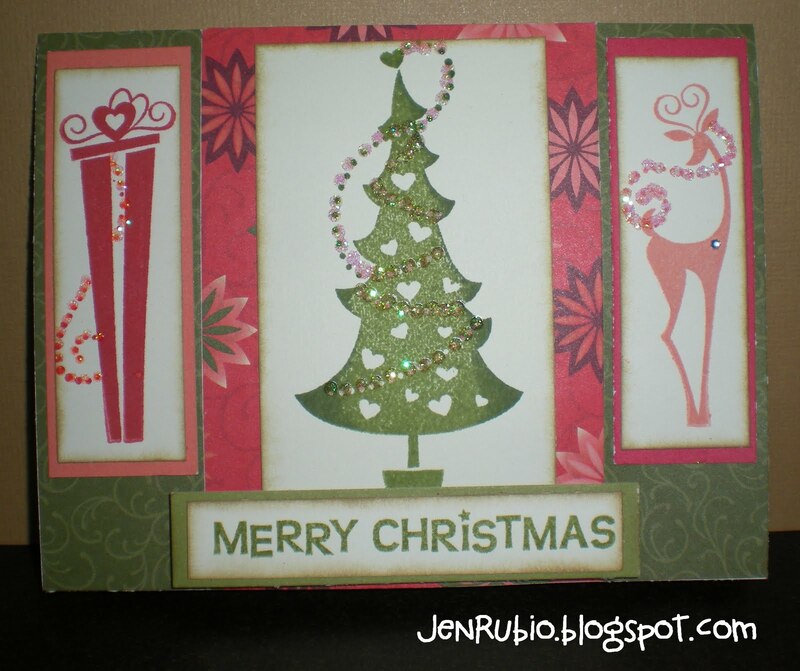 Have a very Merry Christmas!! I will also be selling my Scentsy products at the Harvey House holiday sale coming up on Saturday, December 10th from 9am-5pm, so feel free to stop by my booth that day to say hello and I will have a little hand-made Christmas "goodie" for you (as well as a lot of great gift-giving ideas)! WELCOME to my blog and thank you for joining us for our November Stamp of the Month blog hop!! If you've just joined me from Michelle's Blog, then you are the right path! 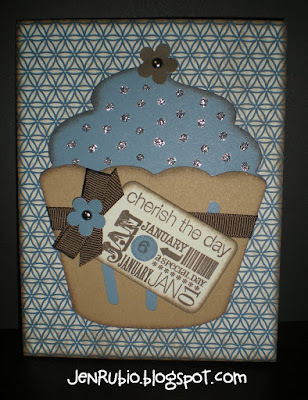 Today I'm sharing a simple standard-size birthday card that uses the Elemental papers X7141B and the Art Philosphy Cricut Cartridge. 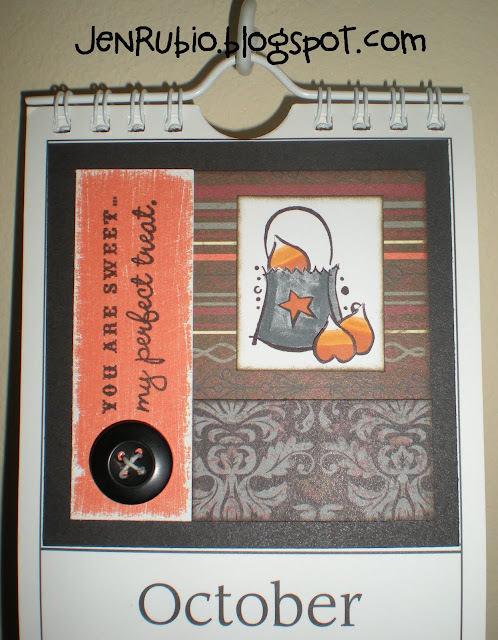 Colors I've used include Cocoa, Colonial White, Creme Brulee, Desert Sand, and Sorbet. 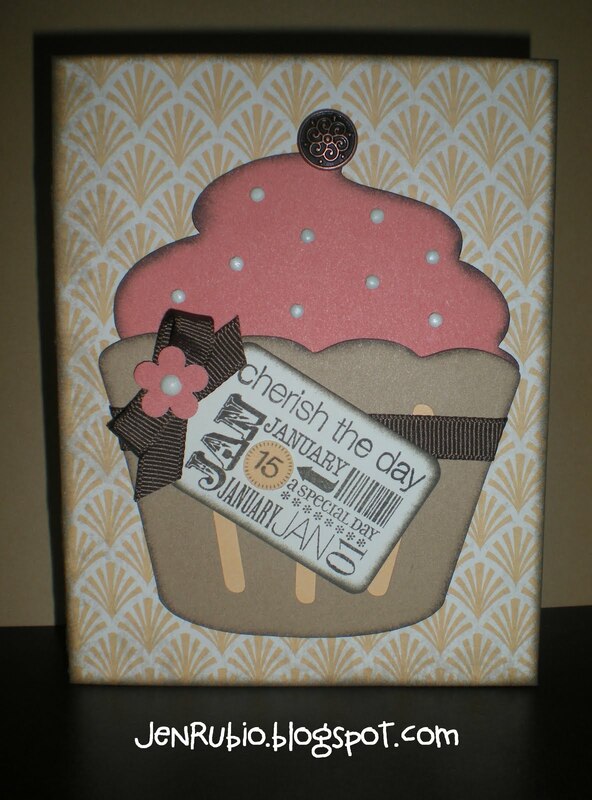 The cupcake images were cut at 4.25" and the scallop-topped tag (tag3) was cut at 2.5." 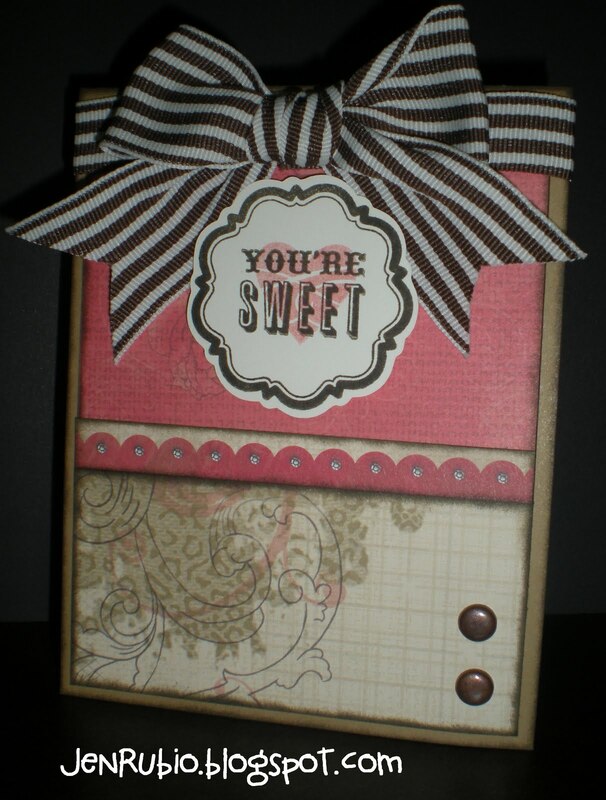 I will be giving this card to my sweet daughter Wendy whose 9th birthday is coming up on January 15th! 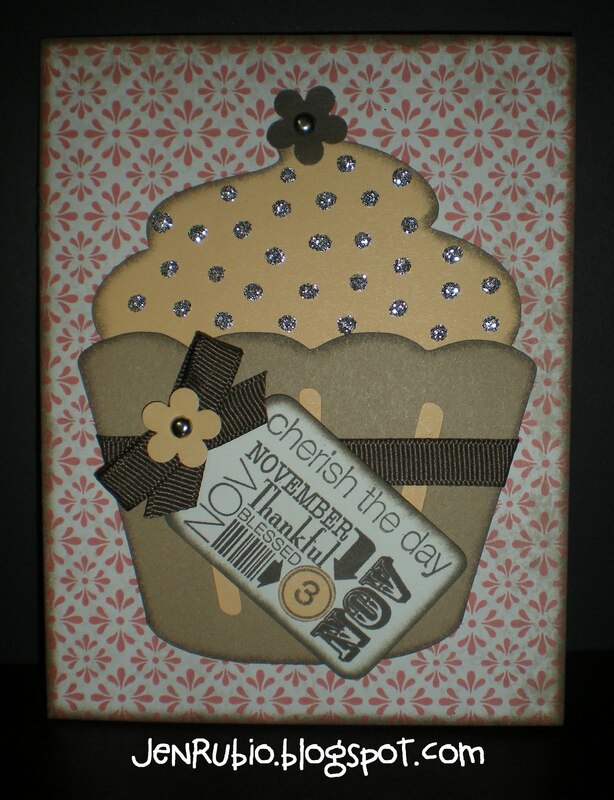 in this month's stamp set "Cherish the Day" S1111. 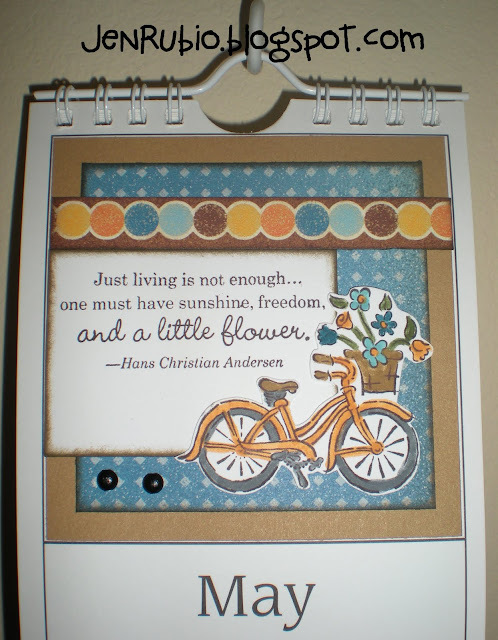 Now you can continue on with the rest of our Blog Hop to see more beautiful artwork using the "Cherish the Day" stamp set by visiting Lori's Blog next! Enjoy!! 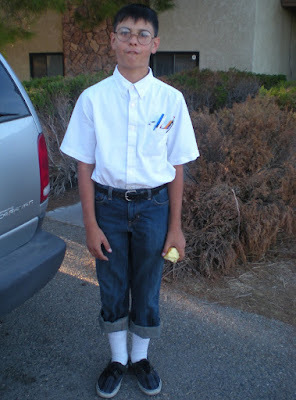 I just thought you might enjoy seeing my kids in their costumes today! 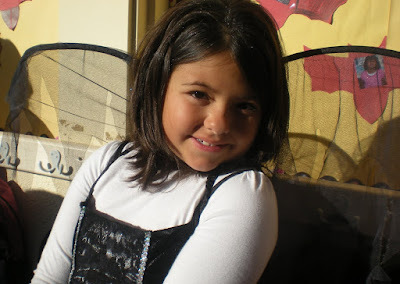 Wishing you all a very Happy Halloween!! (all her idea, don't know where it came from, lol). 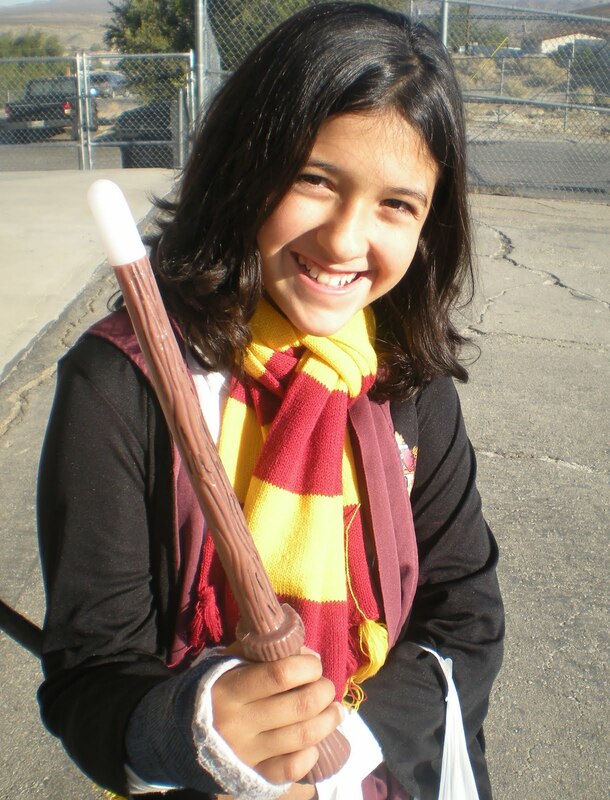 (yes, we are still obsessed with all-things Harry Potter. Great face Jose! 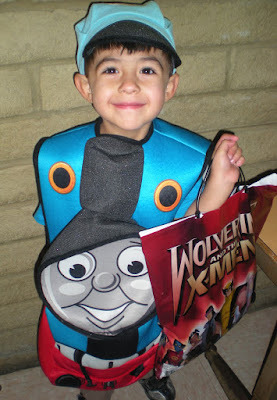 (such a character, lol)! Emily will turn 15 in just 3 more days! "Christmas Card Buffet" cards for October! 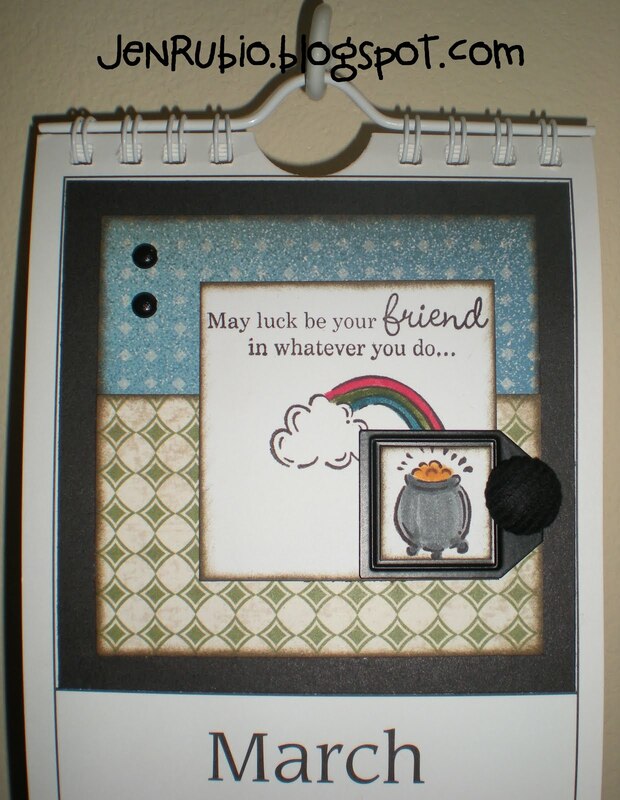 shown on page 83 of the current Idea Book! 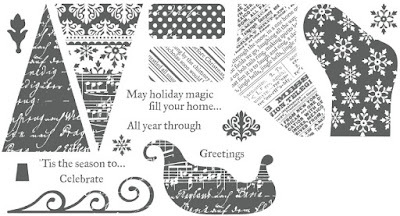 These are the Christmas Cards I'm offering for you to create with me during October (on the 20th, 21st, and 27th) while supplies last for just $1 each!! Scroll down to the post just before this one for my full list of October dates and times. 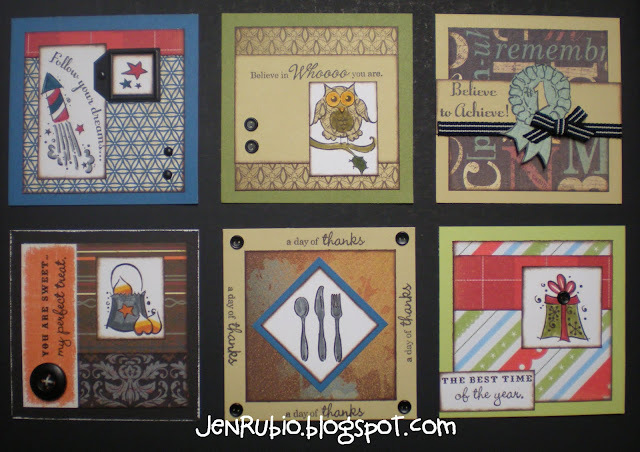 You may recognize some of these card designs as ones I've already offered at workshops in the past (and most of the papers and stamp sets used are now retired). I'm offering them up again now because I still have quite a few left-over pre-cut kits that I'd love to use up and keep from going to waste. 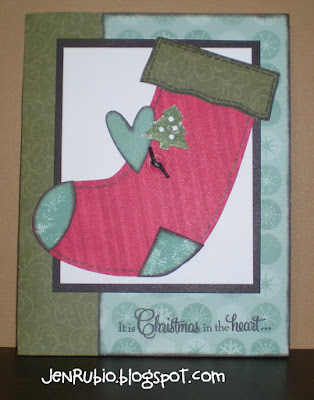 I am also working on designing 8 more all-NEW Christmas Cards for you to create with me on Saturday, November 12th (4pm-10pm) and a few other play dates that I will be offering in November! I will be posting photos of the NEW cards here soon also! So you can get a head-start now by making a few of these Christmas cards with me in October (shown above) and then plan to join me again in November for even more Christmas cards using all-NEW stamps, papers, and embellishments! I've had to change my usual class schedule quite a bit this month due to all of the family commitments that I have coming up every Saturday in October (it is such an exceptionally busy month for us)! This coming Saturday 10/8, we will need to start later than usual (7pm) due to having kids involved in the Marching Band/Field Show Tournament at Barstow High that afternoon and evening. 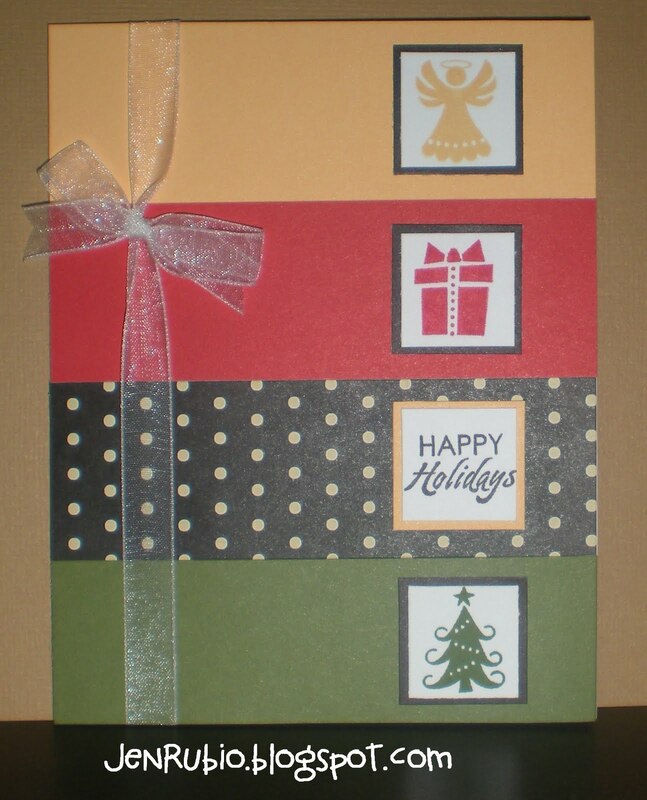 ...and for those of you who have been asking, I have been working on designing a brand-new Christmas Card Workshop that will start on November 11th and 12th, so you can mark your calendar for that now too if you're interested (photos and more details to come soon)!! 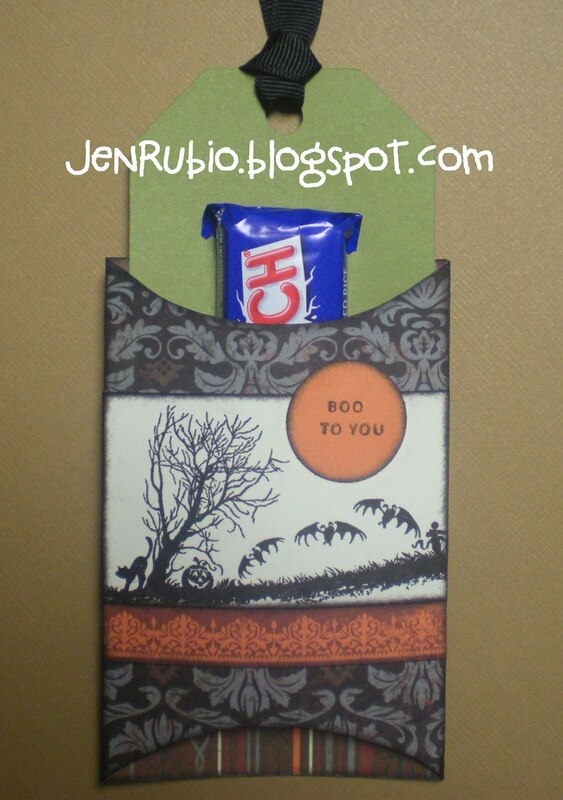 Make 3 items - two cards and a pocket-tag treat-holder for Halloween (shown below!) Price does not include adhesive (so bring your own or purchase from me as needed). 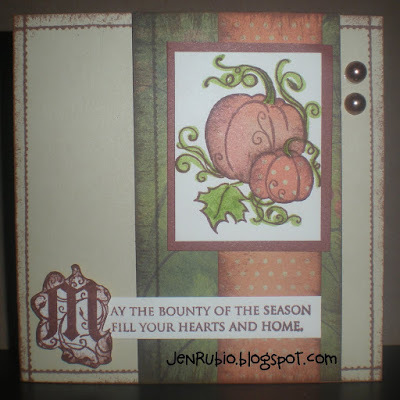 Choose and make any 3 cards from my stash of left-over pre-cut card kits from previous classes I've offered. 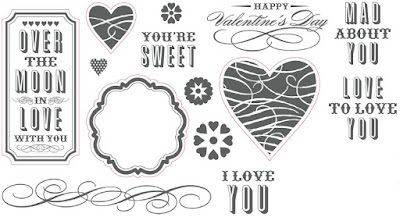 Price does not include adhesive (so bring your own or purchase from me as needed). Finish the Event Calendar(s) you may have already started with me on 9/24 OR it's not too late to begin one or more of them now (I have 9 available kits left to sell)! 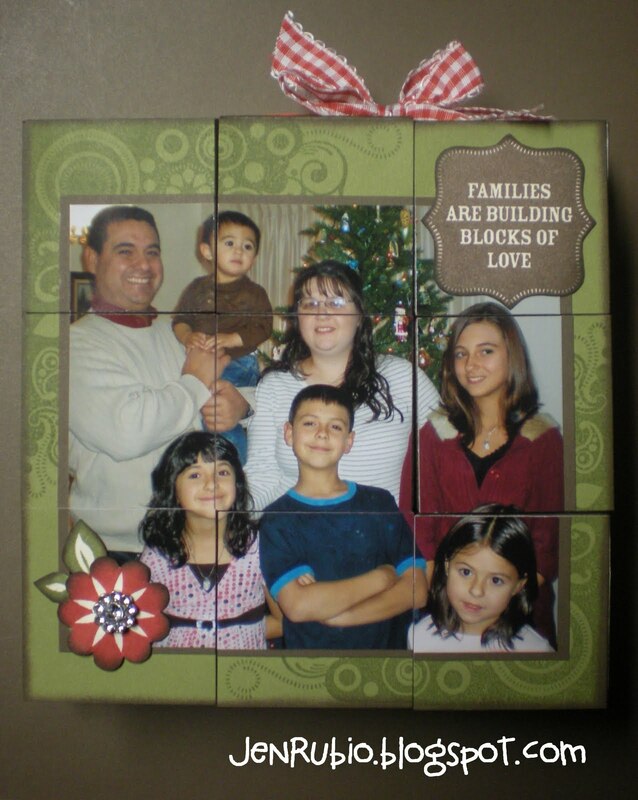 Click here for photos of the project and details about pricing. 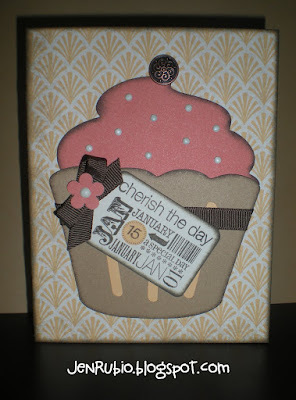 Price does not include adhesive (so bring your own or purchase from me as needed). 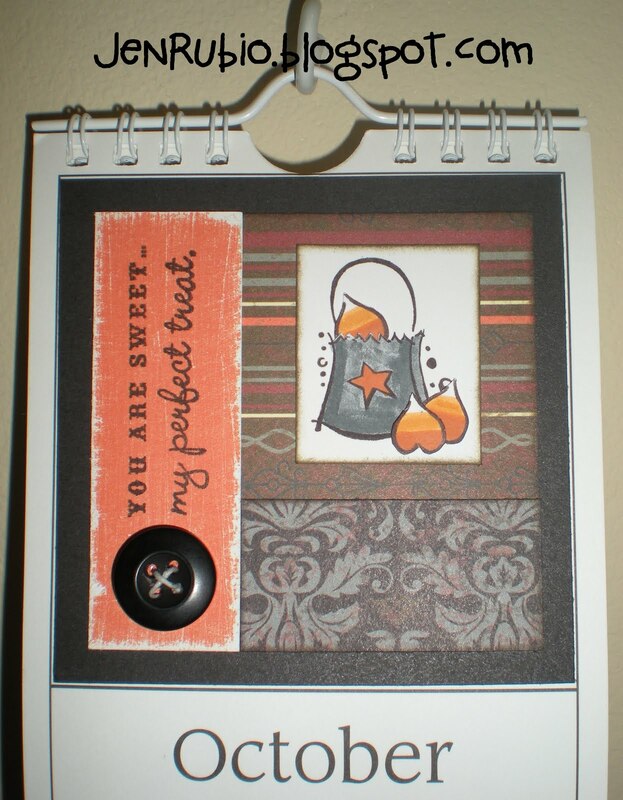 For around $20, you can make two beautiful two-page 12x12 layouts (4 pages), or for $29.95 (plus tax and s/h) you can create these same layouts and get to keep the matching C-size stamp set you've used to make them! 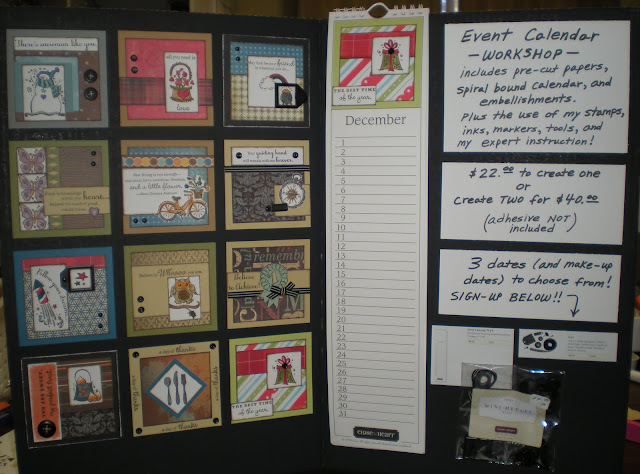 Create any of the WOTG layouts with or without the bonus projects shown in the Idea Book when you pre-order your supplies at least a week before you plan to join me at a "playdate". I do have some of the more in demand kits already "in stock" for you to choose from while supplies last on a first come, first serve basis. 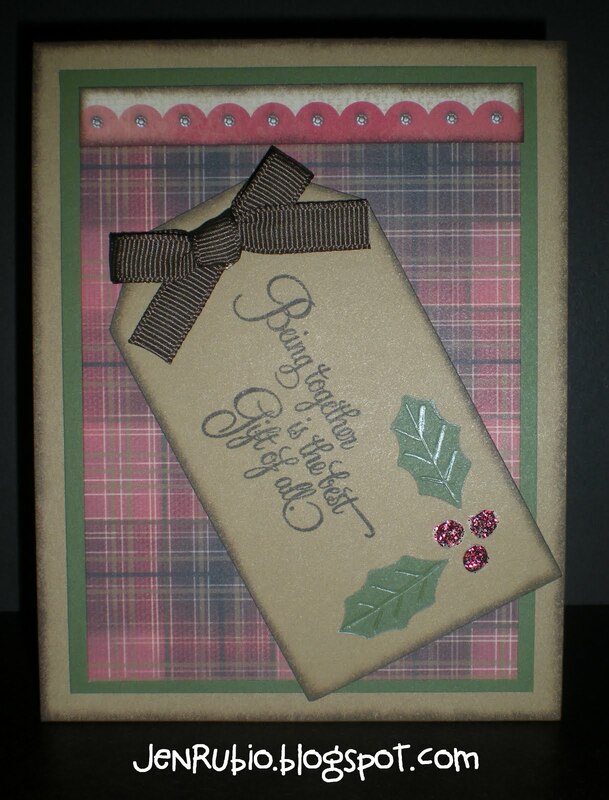 I currently have ONE Roxie kit (p. 25), ONE Elemental kit (p. 31), TWO Sonoma kits (p. 43), ONE Believe kit (p. 55), and ONE Wonderland kit (p. 61) on hand available for purchase. 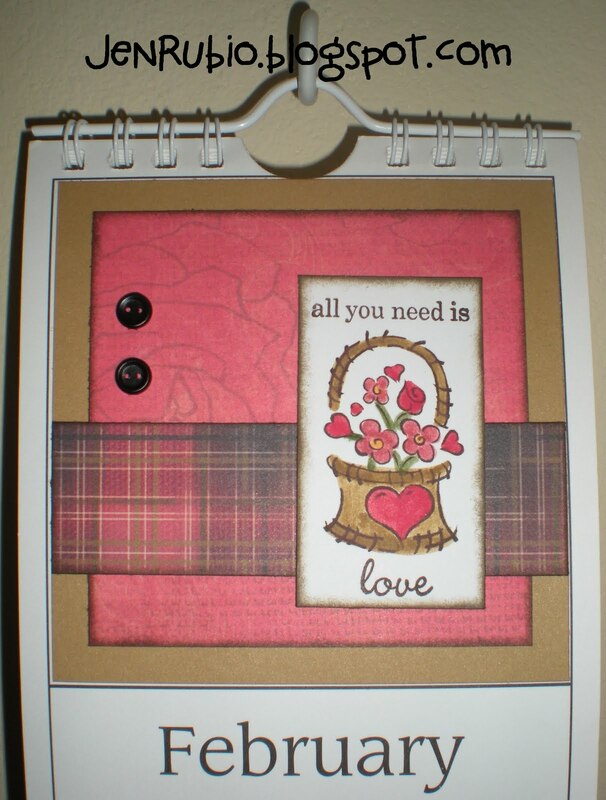 Bring any supplies you already have to use to come and create to your heart's delight! You are welcome to use any of my stamps, inks, and tools as needed so you can get done whatever projects you want to finish! 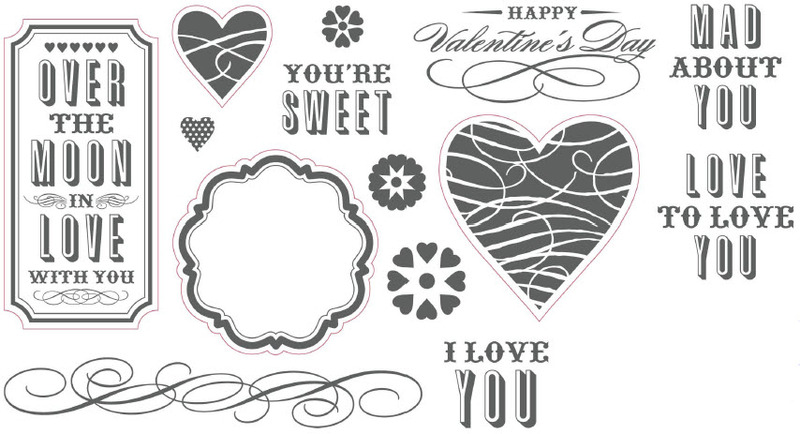 I also have a variety of cardstock and patterned papers available for you to purchase individually by the sheet to use as you create. 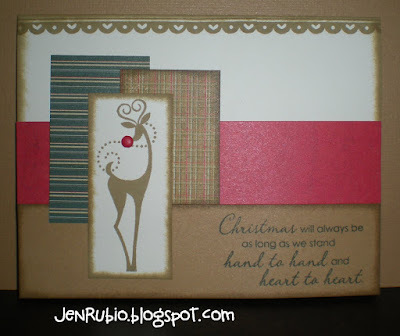 You will want plenty of paper to use with my NEW Cricut machine and our AWESOME Art Philosophy cartridge if you you'd like to try it out (I would love to show you how)!! PLEASE e-mail me, Facebook message me, or call/text my cell phone (760-220-0683) to RSVP at least a day before you plan to join us. Space is limited and I need to know ahead of time how many people to be prepared for on each date! 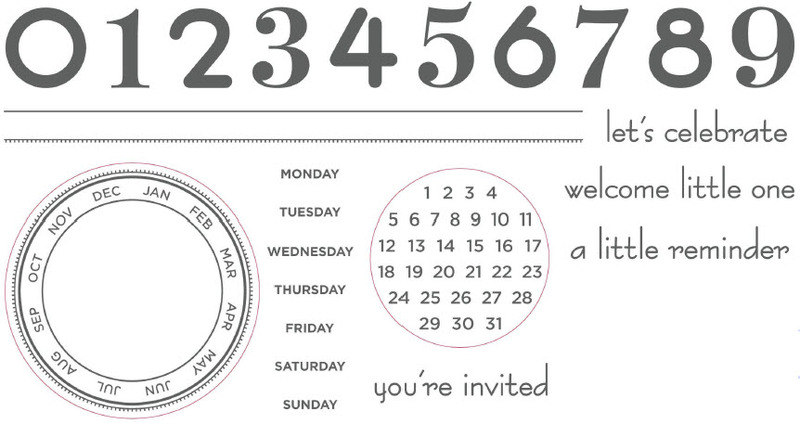 THANKS so much for your rsvp's and I will look forward to seeing you at one or more of my upcoming events soon!! 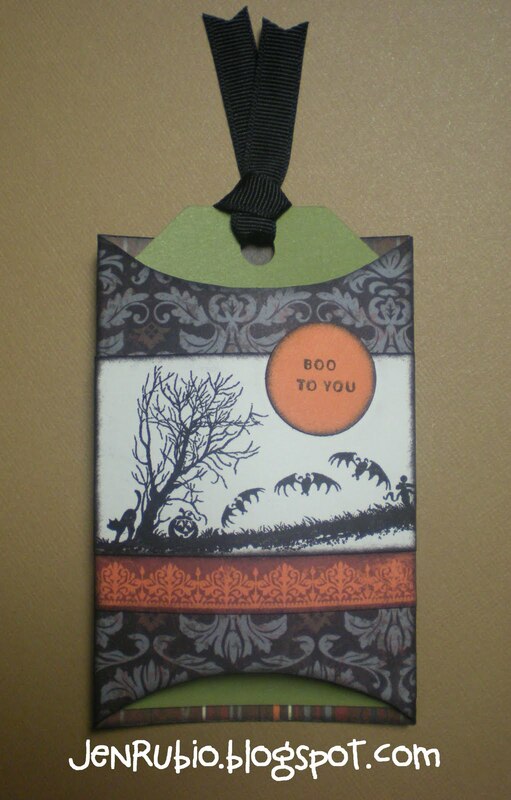 Pocket-tag Treat-holder for Halloween featuring the Captured Moments stamp set C1423 and Mischief papers X7114B (shown above and below) inspired by my friend, Nikka Geers. 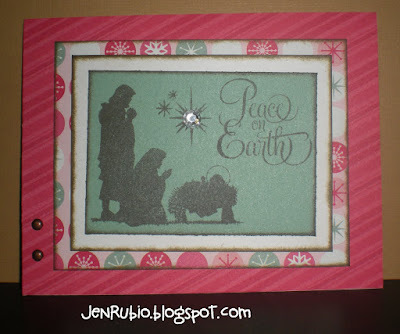 You can click on this link to Nikka's blog for her instructions how to make this using the "pillow box" cut from our Cricut Art Philosophy cartridge (I cut my pillow box at 5.5" and the tag is cut from Olive cardstock at 4.5"). and Glitz Bronze Glitter Gel Z1483. 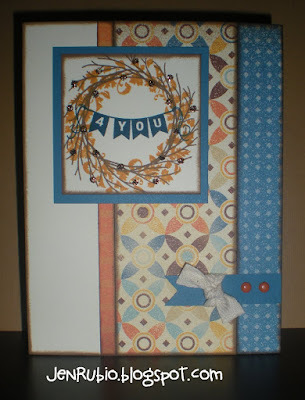 "Sentiment-ally Yours" Heart to Heart Challenge! 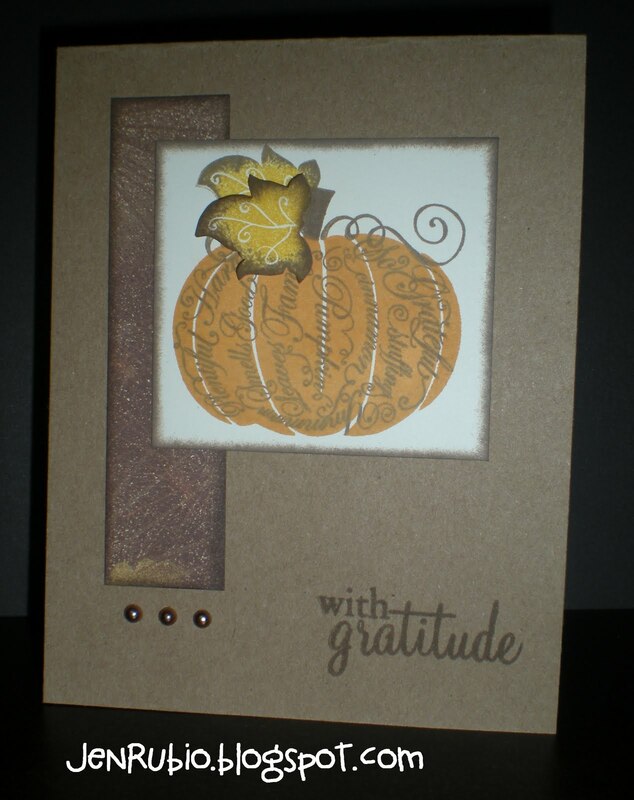 This standard size card is inspired by Originals - Upper Level Focus (p. 42). 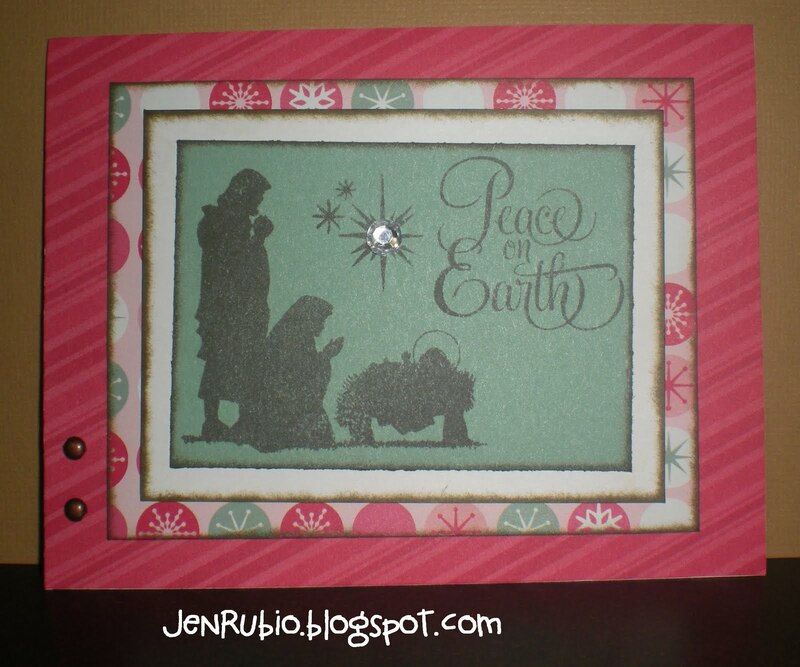 It uses the now retired Aspen papers with two different stamp sets to stamp the sentiment, Holiday Jingle C1371 and Peace on Earth D1243 (also both retired). Ink colors I used are Outdoor Denim and Twilight. 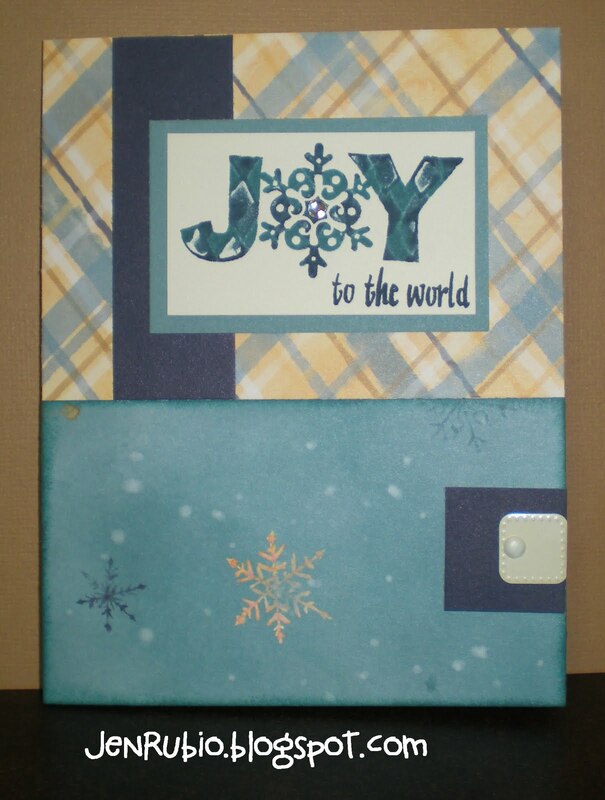 To achieve the fun pattern on the "Joy" stamp, I used the "dirty kiss and twist" technique. Now, I know what you're thinking, that technique doesn't sound like it should be done in public, but I promise it's not as bad as it sounds, lol. 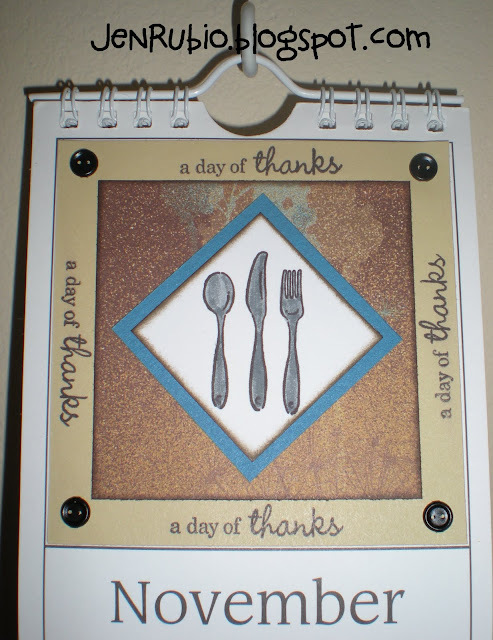 I simply inked a patterned stamp (from Argyle Backgrounds D1325) with Outdoor Denim ink and laid it on my work surface stamp-side up. 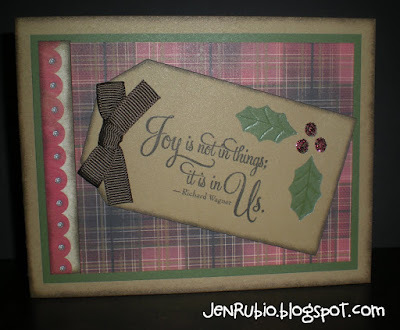 Then I inked the "Joy" stamp with Twilight ink and stamped it on top of the background stamp "kissing them together and twisting about 1/4 turn" before carefully lifting the stamp straight up and stamping it on my Colonial White cardstock. 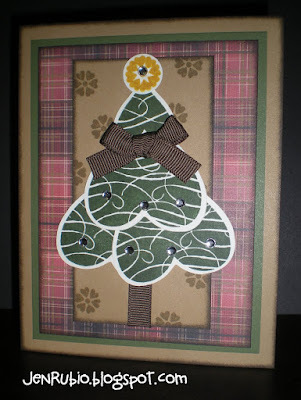 (Ooops, I just now realized that I did in fact use one additional stamp other than the sentiments, so I guess this challenge was tougher for me than I thought and I hope that doesn't disqualify this card completely, lol). Remember, you can click on my photo to see it larger if you want to see the fun detail that results when using this technique! 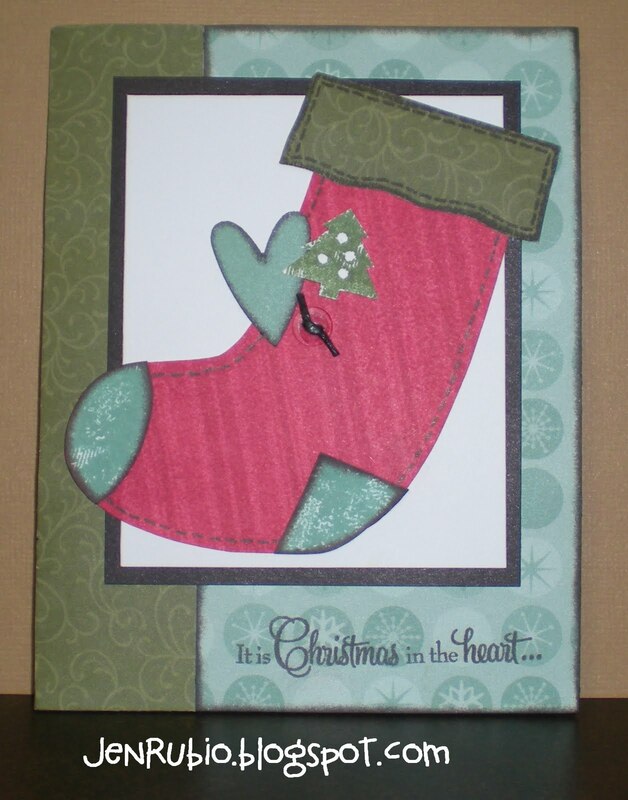 This card is just one of the many different cards I will be offering for you to make with me at my "Christmas Card Buffet" coming up on Saturday, October 15th (10am to 2pm) during our Relief Society Super Saturday Craft Day!! (This event will be held at my church where non-members are always welcome to join us! It will be a purely "fun and social" meeting, so there will be no "religious" pressure to be concerned about!) Those who attend can "snack a little" by creating just a few of the simple Christmas cards I will be offering this day or "feast a lot" and create as many as you want to for just $1 per card! I will share more of the cards I will be offering here on my blog soon, but you can RSVP now if you want to! 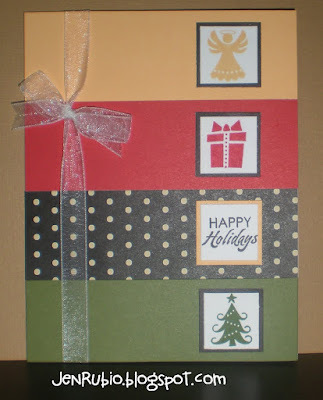 Holiday Magic (October SOTM) Blog Hop!! 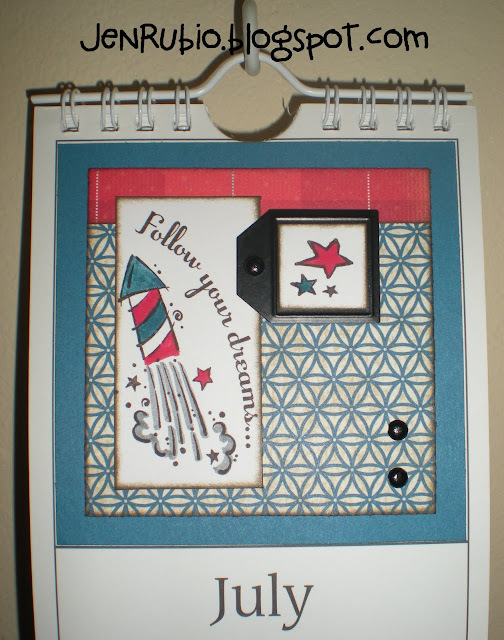 First up, is a 3.5"x8" card design inspired by Wishes - Right Design (p. 42). 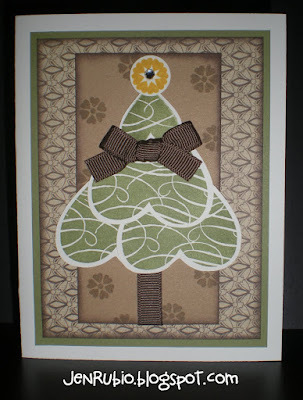 This card features the Roxie paper pack X7140B and all it's colors (Black, Colonial White, Desert Sand, Smoothie, and Tulip), plus I added New England Ivy for stamping the tree and sponged all of the card elements with Cocoa ink. The banner is inspired by the banner shown on the Typeset layout on the front of our current Idea book! Each pennant was created by stamping the ribbon tail from the "ribbon award" stamp in the Blue Ribbon C1464 stamp set shown on page 17 with Desert Sand ink and cutting each one out by hand (something I haven't done much of at all since I started using our Cricut Art Philosophy cartridge a few months ago, lol)! The letters are stamped with the A Typeface A1117 stamp set (August 2011 promotion) in black ink. 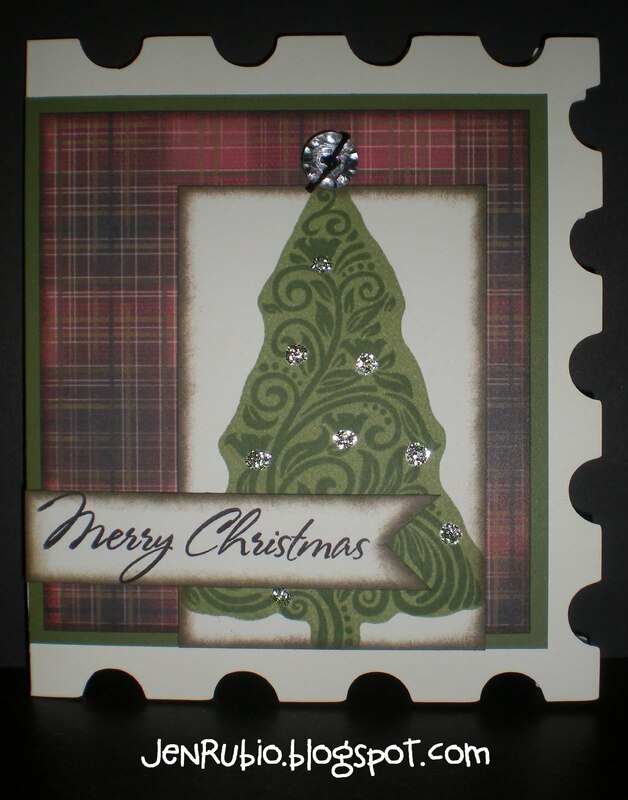 The tree is topped with a Bling Assortment Z1466 button with Black Waxy Flax Z1089 tied through it. The banner hangs from Black Hemp Z282. 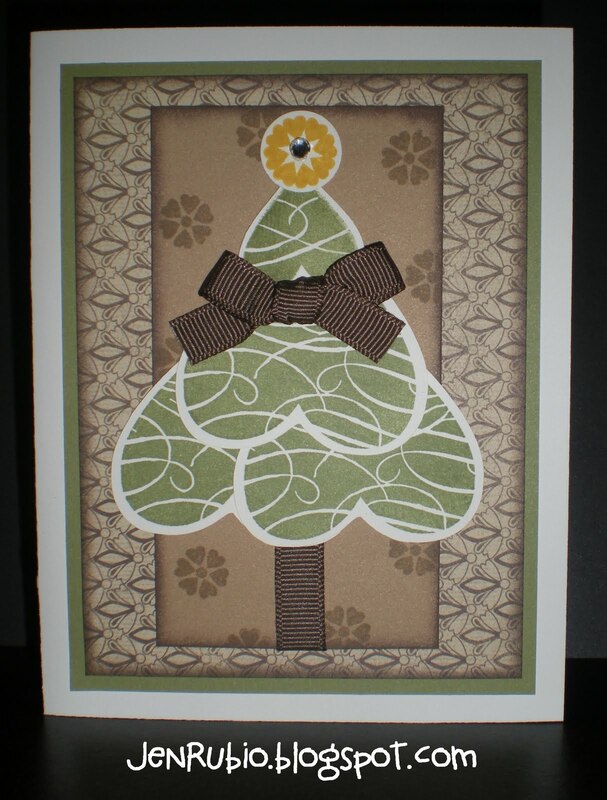 Next, I have a another "Tree" card that features the Believe paper pack X7145B. This one is standard size and inspired by the Wishes Greetings Card Workshop - Card 2 (p. 112). 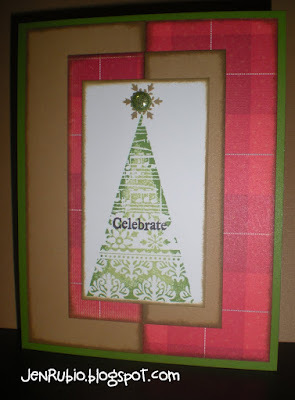 To create the tree I used "stamp rolling" technique, by inking the tree in Sweet Leaf ink first, then "rolling" the outside edges with Topiary ink. 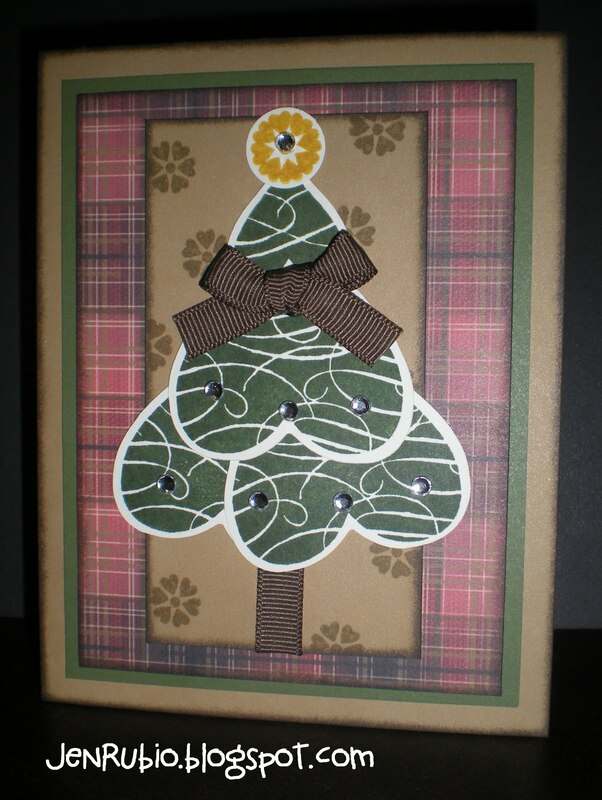 Lastly, here's another simple standard size card inspired by the Wishes Greetings Card Workshop - Card 4 (p. 113). I've used the Believe papers again, and the "Star" was super easy to make. 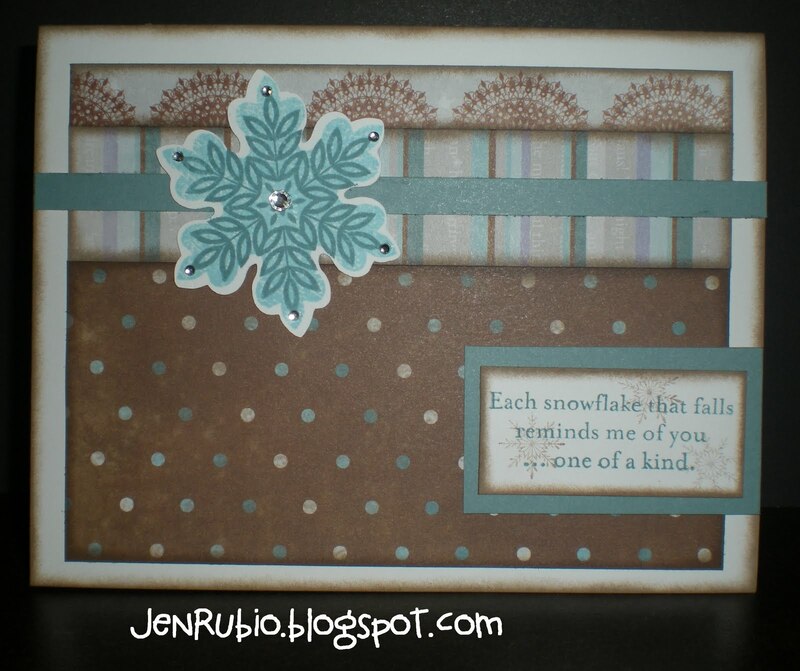 I simply stamped the white surface of a Dimensional Elements Star Z1680 with the leaf stamp from this set and Desert Sand ink to make it look like a giant snowflake inside the star. Then I used my piercing tool to poke a hole through the center for my sparkley brad. 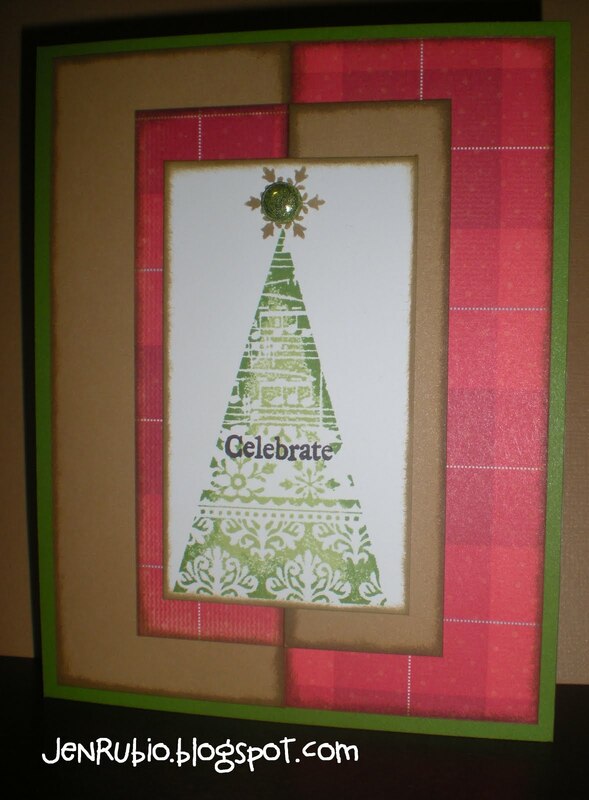 The "Celebrate the Season" sentiment comes from the Glory to God D1483 stamp set (p. 83). 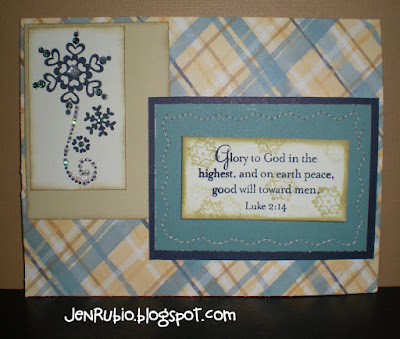 by visiting Teresa's Blog next! Enjoy!! I do still have a few spots left for my Event Calendar Workshop that is coming up this Saturday, September 24th (4pm to 10pm)!! It's not too late to contact me to reserve your spot now!! or Create TWO calendars with me for $40! 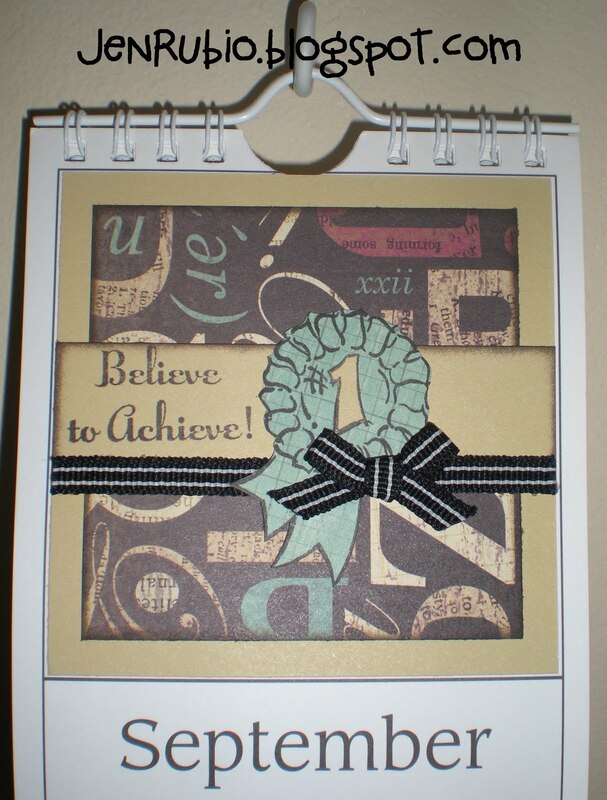 This price includes all of the papers you will need (pre-cut and ready to stamp and assemble), the 4"x18" spiral-bound calendar (Z126, shown on page 129, $8.50), and all of the embellishments needed (Z1393 Black mini-medley accents collection $4.95), PLUS you get free use of my stamps, inks, and other tools I will teach you how to use (my expert instruction is free when you purchase from me)!! 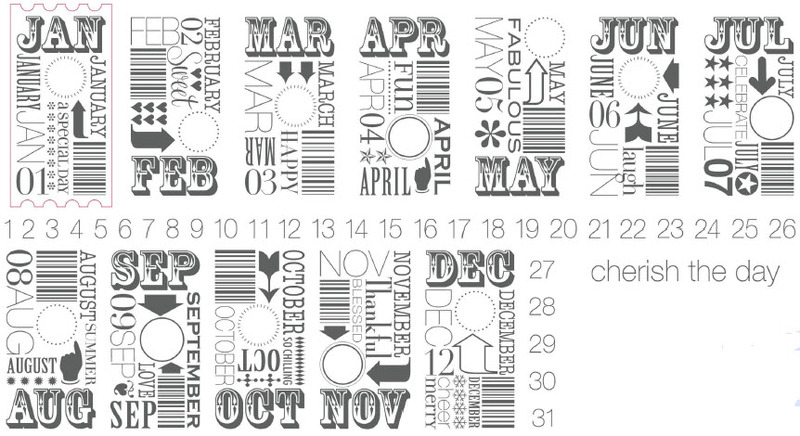 Now, if you're wondering what exactly an "event calendar" is and what makes it so useful...I will tell you! 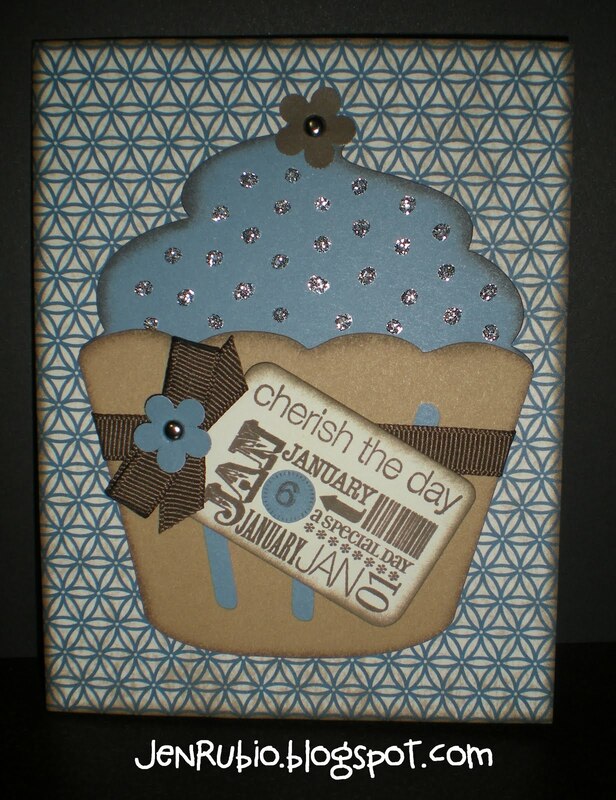 An event calendar is a place you can write down all of the birthdays and anniversaries you celebrate each and every year. 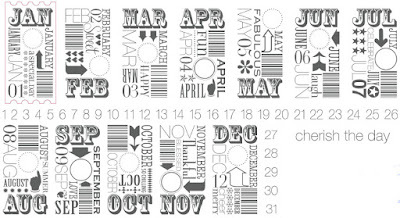 You can hang it on your wall in your home or office to help remind you of important dates you want to remember and you can re-use it again and again year after year!! 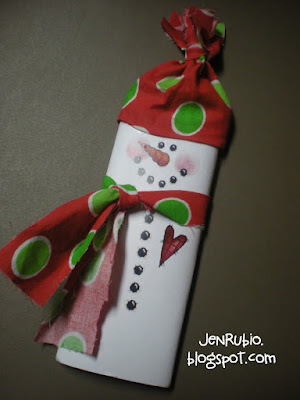 Why not create one for yourself and create another one to give as a gift?!! Or, if you want to invite a friend to attend and enjoy this fun workshop with you, I am happy to give you the 2 for $40 price deal (meaning your cost will be just $20 each for both of you)! 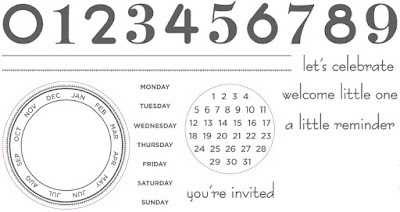 To start, I am offering you THREE DATES to choose from (you can attend any one or all of these dates, come at any time that works best for you) on Saturday, September 24th (4pm to 10pm), Friday, October 7th (6pm to 10pm), and/or Friday, October 21st (6pm to 10pm). Experienced stampers can expect to complete one calendar in about 3 hours. 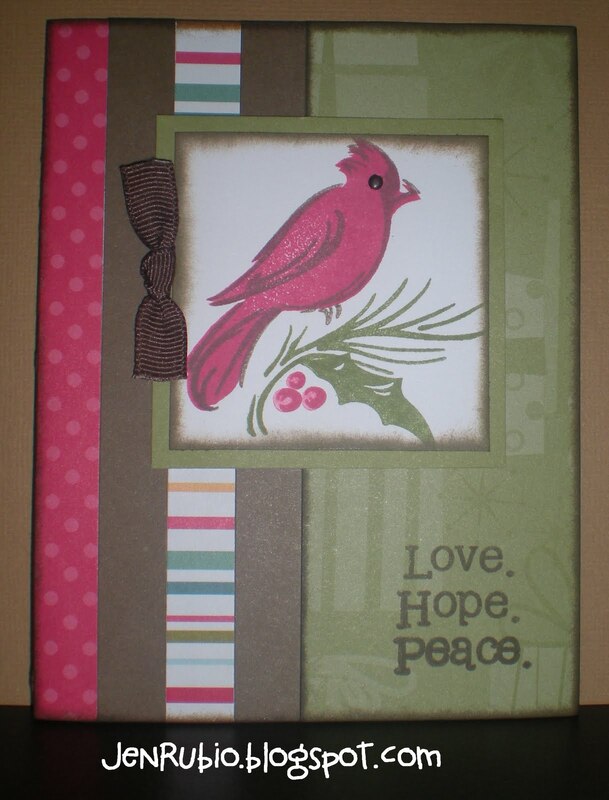 If you are new to stamping and paper-crafting or you just want to take your time, it could take you up to about 6 hours at the most. 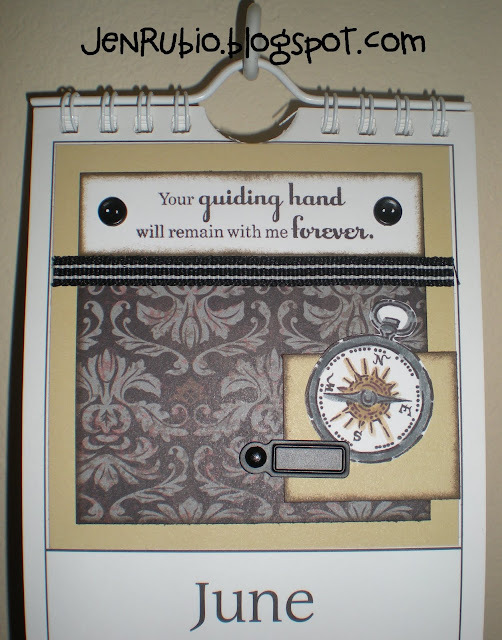 I will continue to offer additional time in my stamp room to complete this workshop on the 2nd and 4th Saturdays in November also, if you need more time to create additional event calendars or if the earlier dates just don't work out for you. piece partially inside/behind the bag opening!